Explorez les temples de Delhi et la diversité des religions de l'Inde lors d'une excursion privée d'une journée complète. 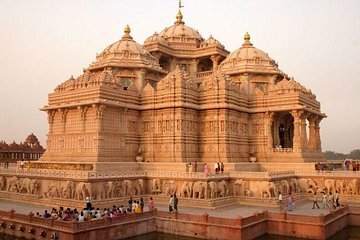 Accompagné de votre guide privé, découvrez le temple ISKCON, le temple Lotus, le temple Chattarpur, Gurudwara Bangla Sahib, le temple Akshardham, et Birla Mandir (temple de Lakshmi Narayan). L'excursion inclut les droits d'entrée, un guide et un véhicule privés avec transfert depuis et vers l'hôtel. The tour was incomplete. They díd not take us to all the temples in the itinerary. They took us to a shop we dont know why and what for. Speaking spanish guide was TERRIBLE and very unpreparated. Guide was not polite. Was always in a hurry, trying to finísh, I guess they are tired of going to same temple again and again and dont think how much effort takes for us to take this vacations and fullfilt these Dreams. I hardly NOT RECOMEND THIS TOUR. my money was NOT well spend. So sad. Excellent tour - saw many temples and the guide was very knowledgeable and friendly. Amazing tour. Totally recommend it. The choice of temples to visit is carefully planned, giving an array of spiritual experiences that no visitor should miss, plus they are breathtaking. Additionally, the guide is very knowledgeable making it a great experience. It was my first time in India, and my colleague and I decided to do the all-day tour of the Sacred Temples. It was really amazing. Our guide was very knowledgeable and provide wonderful history, insight and context around each temple and the religions that founded them. You stay in Delhi so the trip is very manageable. Lunch is also included in the cost, plus the guide stops at a government sanctioned craft store for anyone that wants to pick up gifts. Frankly, the store is grossly overpriced in my opinion and the merchants are a bit pushy I'd recommend the Khan market instead for your shopping needs.. Bottom line: I'd highly recommend this tour to anyone interested in temples in Delhi. I plan to return to India in a few months and will be planning another tour through this company, without question. I would highly recommend this tour to anyone visiting New Delhi. We were fortunate to have a young man to lead our tour. He was extremely informative and knowledgeable of all the areas we visited. Extremely prompt, and explained each temple to us in full detail and when each temple was visited, informed us of the next temple. He did not rush us through the sites and took pictures for us along the way. After the final temple, At the end of the day, I asked to also stop at the Sacred Heart Cathedral and this was accommodated as well. I would book this tour again when I visit New Delhi again. This was an excellent tour with a great guide. Prashant was very knowledgeable and peppered the information he gave us with stories and a few jokes. It's wise to get a good night's sleep before because there will be a good amount of walking and listening to do, but it is definitely worth it! Those who really like learning about the history and culture of the sites will enjoy this tour the most, but probably anyone would enjoy these sights and the experience. We had a terrific time and found it very worthwhile.